I have never really been a huge Queen fan, but for some reason their songs keep getting stuck in my head. I recently wrote a story about my wife in which I made a quick reference to the song You’re My Best Friend by Queen. It had been stuck in my head and was at least part of the reason I wrote about my wife being my best friend (see My BFF). Of course, I mentioned that there was another story connected to Queen. I have said that often (I really mean it when I say it), but usually I do not get around to telling that other story. I figured I would stop that habit today and tell the other story. 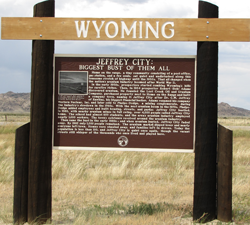 Whenever I think of the rock and roll group Queen I think of a place called Jeffrey City, Wyoming. We only lived there two separate times for nine months total – one summer and a most of a school year – but for some reason I have vivid memories of the place. It was windy and cold in the winter and it was windy, hot, and mosquito infested in the summer. I suppose it still is all those things, but now it is just a ghost town. All of my memories of Jeffrey City center around doing stuff with my few friends there and I have captured at least some of those memories in different stories I have written (see Jeffrey City, Wyoming). Most of my memories are of horses and horned toads (which of course, we called horny toads) and the community center. That community center was where Queen comes in. The community center was just a huge Quonset hut out near the edge of town. We went there during the summer and decoupaged pictures on wood. We watched movies on a big screen. We skated. And we listened to Queen. We listened to Queen when we were decoupaging. We listened to Queen when we were skating. We seemed to listen to Queen whenever we were doing anything. Looking back, I am sure there was only one album playing over and over and over again. We heard Killer Queen, You’re My Best Friend, and Bohemian Rhapsody (Scaramouche?). Then, we heard Killer Queen, You’re My Best Friend, and Bohemian Rhapsody (who is Scaramouche, anyway?). Then, we heard Killer Queen, You’re My Best Friend, and Bohemian Rhapsody (and why should Scaramouche fandango?). I never really cared or even remembered that this was happening, but even now whenever I hear a song by Queen, I am taken back to Jeffrey City and that big Quonset hut. And I am decoupaging or skating. I am sure it was not exactly like that, but it sure seemed like it. Then again, maybe it was exactly like that. After all, my memories of mosquitoes sucking pints of blood from children was given credence when we visited the ghost town a couple summers ago. I have stopped in Jeffrey City a couple times since we lived there. The last time, I took my family there on the way back from Colorado. We drove to the two different houses where we lived in the company town and discovered that only the foundations remained. Apparently, the houses were sold and taken away when the company dismantled the town. However, the deserted Quonset hut still remained and there were a few shops open, but there was little else to show that anybody had ever lived there. Only a plaque near the highway told a short version of the story of the town. Even though there were few people and many of the houses were gone, the mosquitoes were still there. When I got out to take a picture of the plaque, the car was immediately swarmed by what seemed like thousands of them. It was like they were just waiting for the door to open. Thankfully, we were able to kill them off and mosey on down the road. And even though I did not think of it then, the mosquitoes gave a bit of credence to my other memories of Jeffrey City. Seeing the foundations of the houses where we lived, almost getting eaten by the mosquitoes, and looking at the old Quonset hut helped me fondly remember a short part of my childhood. As we drove off to the next part of our family adventure, I looked in the mirror at the old Quonset hut. I could see myself decoupaging and roller skating. And all the songs in my head were by Queen.